Class of 2014 grads Jimmy Jones, Jr. and Christian DiMarco fired rounds of 72, 61 and 67 to capture the 2014 Two-Man Shoot-Out title by two strokes. The opening round 72 in the modified alternate shot, tied the duo for the first round lead with the teams of Donald Wolfe III and Matthew Cheezem, and Cody Olson and Kaleb Johnson at Lely Resort's Mustang Course. Rocky Rogan may have had the highlight of round one when he aced the par-3 8th at 150 yards en route to his team's 73; one stroke off the lead. Round two and three would move over to Lely's Classics course, where the team would take it deep on Saturday afternoon, with an impressive 61 in the second round scramble and hold the lead going into Sunday by one. Sunday, playing with the team of Wolfe and Cheezem, Jones and Dimarco fired 67 in the Four-Ball format, besting their playing partners by one stroke and capturing an overall two stroke victory. Jones will be heading to play college golf at Florida Southern in Lakeland next fall, while Christian DiMarco will head to the University of Kentucky. For Jones, the Two-Man Shoot-Out is his second FSGA Championship after teaming with his father, Jimmy Sr winning the 2013 Parent-Child Championship. This was DiMarco's first FSGA Championship. The field of 50 teams played three competitive rounds consisting of modified alternate shot, two-man scramble and the final 18 holes of four-ball. The first round and second round was played on the Mustang Course, with the last round played on the Classics Course. Round 1 Mustang - Green 6,691 yds. Round 2 Classics - Black 6,660 yds. Round 3 Classics - Black 6,660 yds. The Two-Man Shootout is the one of the FSGA's most unique and enjoyable championships combining modified alternate shot, two-man scramble and four-ball. Competitors will play 36 holes on Saturday with lunch and beverages included in between rounds and follow it up with 18 holes on Sunday. Each round is considered a separate tournament with prizes being awarded for each round as well as an overall winner for the Championship. For a look at the 2013 Championship Results click here. Morning Round (Mustang Course) - 8:00 AM shotgun - Modified Alternate Shot (18 holes) where each player drives, then the team selects a ball to be played into the hole on an alternate shot basis. Afternoon Round (Classics Course) - 1:30 PM shotgun - Two-Man Scramble (18 holes). Play-Off - If necessary, there will be a hole by hole play-off for the overall championship only. The format for the play-off will be modified alternate shot. It is the player's responsibility to be present for any play-off. Each round of the Shoot-Out is treated as a separate competition and gift certificates are awarded for each round. There is an over-all prize and Championship Team, but the emphasis and the majority of gift certificates are paid out on the basis of the individual rounds. After 36 holes, the number of flights will be based on the number of teams and/or the range of scores. Practice rounds are available on the Mustang Course only one week prior to the championship on a space available. The price for a practice round is $30 plus tax. Please call (239) 732-1220 to arrange your practice round. The proper place to practice your golf swing is on the driving range, hitting multiple shots on the course is unacceptable. 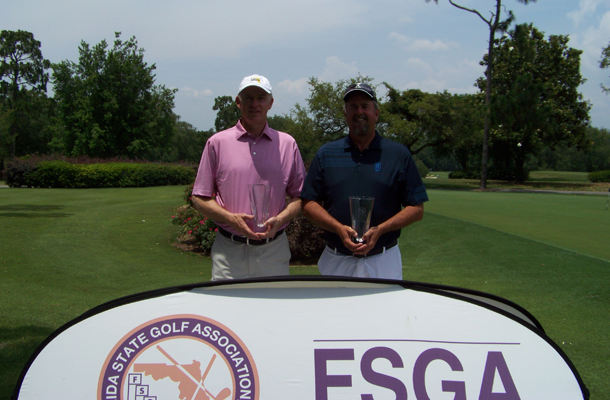 Don Bell, of Port Orange, and Roger Dean, of Ormond Beach, posted a tournament total of 16-under par 200 to cruise to a three stroke victory. The Two-Man Shoot-Out was held at Black Diamond Ranch on May 18-19, 2013. Please click the View Hotels tab in the Tournament Links section for hotels in the Naples area. Lely Resort Golf & Country Club accepts cash, Visa and MasterCard for method of payment.